Travis Yost has been involved in the world of hockey analytics for a decade and is currently part of TSN's Hockey Analytics team. Prior to joining TSN, Travis was a contributor at the Ottawa Citizen, the Sporting News and NHL Numbers, and has been a consultant for an NHL franchise. He will be contributing breakdowns on the Buffalo Sabres for The Buffalo News this season. Follow Travis on Twitter: @travisyost. Whenever a team makes a roster decision of materiality, I think it is critical to conduct a postmortem – regardless of how pleasant or unpleasant it might be. These decisions (be it free agency signings, trades, coaching hirings and so on) are made based on the present-day understanding of teams during continuous roster and personnel evaluations, but there is always a bit of forecasting baked into the equation, too. It’s here where most roster decisions are "won" or "lost," and it’s here where the more successful organizations see a much higher rate of return on their investments. A lot of what we have talked about lately is Buffalo’s now epic second-half collapse. Remember: The Sabres were the top-ranked team in the NHL around Thanksgiving. Since then, the Sabres have been the worst team in the league, playing at a 54-point pace over the last four months. A Western Conference team has had the Sabres season, but in reverse. 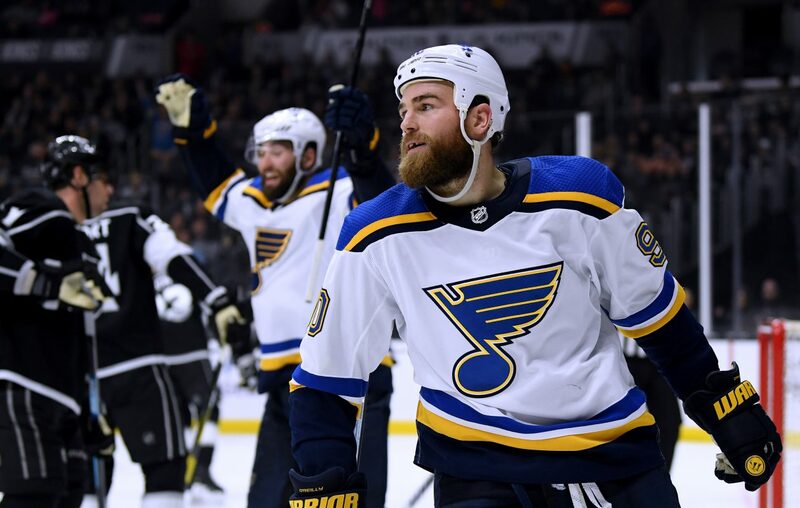 The St. Louis Blues were in dead last at the turn of the calendar year, and were almost certainly preparing for a major fire sale at the trade deadline. Then, fortune changed. Since New Year’s Day, only Tampa Bay has been more successful in the standings. The Blues have played at a 116-point pace over the last three months and could be the biggest threat to emerge out of the Central Division come playoff time. What’s keyed St. Louis’ bounce back in the standings? Some of it had to do with puck luck and the introduction of Jordan Binnington into the crease. The Blues saw their all situations save percentage jump from 89.2 to 92.0 percent, worth about 30 goals in the standings over the second half of the year. Some of it also had to do with their best players making sizable impacts. At the top of that list is former Sabres center Ryan O’Reilly. O’Reilly was traded last summer for a package including two draft picks, Tage Thompson, Vladimir Sobotka and Patrik Berglund. There were surely a handful of reasons as to why O’Reilly was traded – an expensive and buyout-proof contract, some blunt criticism from the player after missing the playoffs and the opportunity to secure some future assets, but a bet against O’Reilly and the aging curve probably sit near the top of the list. Whatever the case, one thing is certain – O’Reilly’s game hasn’t slowed down. His 2018-19 campaign with the St. Louis Blues could end up being his best season. 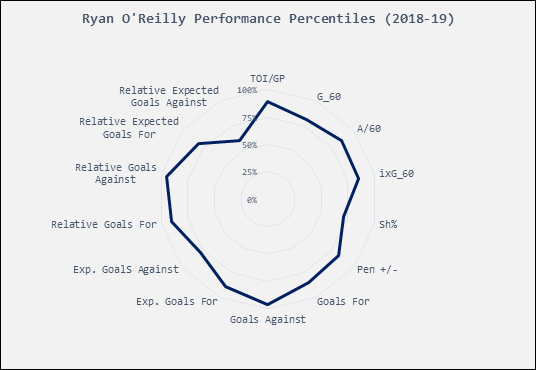 O’Reilly has been a regular two-way producer since the 2011-12 season, and this season has been easily his most impressive offensively speaking. Through 77 games, O’Reilly has 27 goals and 46 assists (73 points; 35th in the NHL), which is indisputably first-line performance. The underlying numbers are more impressive though, and show just how effective O’Reilly has been at impacting both ends of the ice. Counter that with the personnel Buffalo brought in to replace O’Reilly. Again, I think a good piece of this trade was Buffalo clearing an expensive contract and securing future assets like the pair of draft picks. 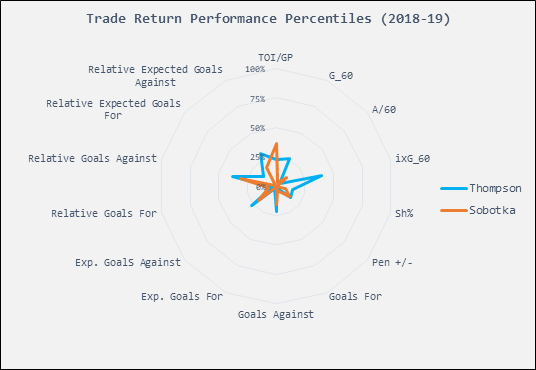 But the return pieces – the players brought in by Buffalo to smooth out some of the salary imbalance in the trade – have been, well, quite different when it comes to performance and results this season. Thompson and Sobotka (and Berglund) couldn’t possibly have replaced O’Reilly’s production. It’s the classic case of four quarters not really equaling a dollar when it comes to analytics in a salary cap, roster-constrained industry such as the National Hockey League. But adding three players who really gave Buffalo nothing more than fourth-line minutes has been nothing short of a disaster. That Thompson, Sobotka and Berglund couldn’t beat fourth-line minute performance actually lends itself to the possibility that mere replacement level players from Buffalo’s farm system could have been injected into the lineup with no discernible change in performance. That’s concerning. I’d say Thompson does have something of an excuse. He played tough minutes for a 21-year-old, second-year professional. That’s the combination of weak quality of teammates and heavy defensive zone deployment. The pressure will surely be on him to rebound next season in the final year of his entry-level contract. As for Sobotka and Berglund? One is gone, and the other should be out the door in relatively short order. Which means the O’Reilly trade has been reduced to two draft picks and marginal long-term salary cap relief. Sometimes postmortems can be ugly. Unfortunately, this is one of them.